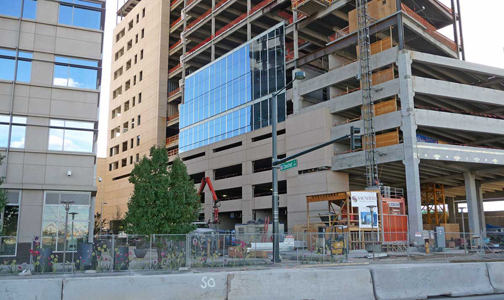 This week the DaVita building construction hit a milestone, the first glass. This is always an exciting point because the skin of the building starts taking shape. Additionally, the “missing corner” has begun construction as well. This is where the tracks for the old light rail use to curve around the Millennium Bridge. Now that the light rail goes under the bridge and the old tracks have been removed, the corner is now coming out of the ground.